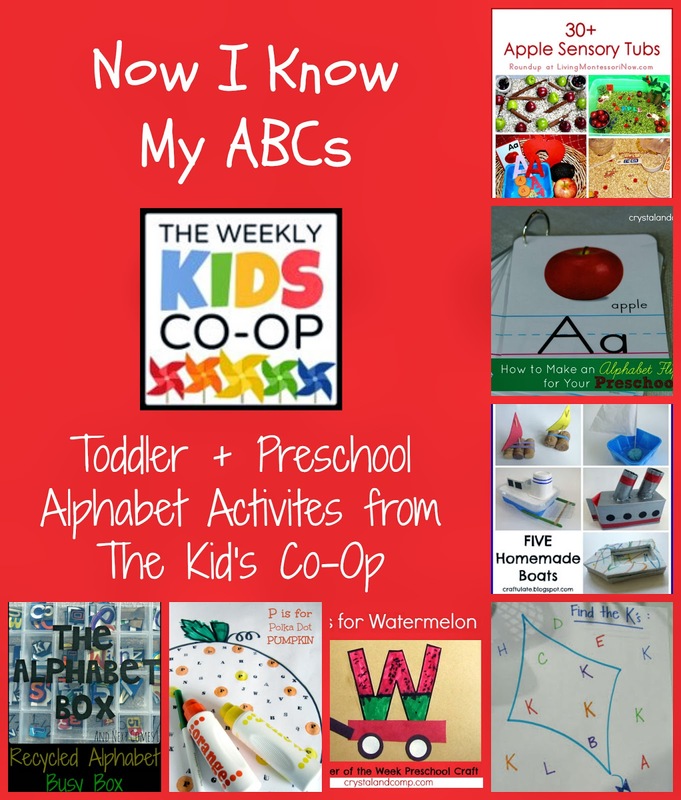 I decided to highlight toddler and preschool letter learning ideas and alphabet activities from The Kid's Co-Op this week, since I was a bit behind in posting my Tot School Letter D post. (I wanted to post in on Tuesday, but we still had activities to do today). 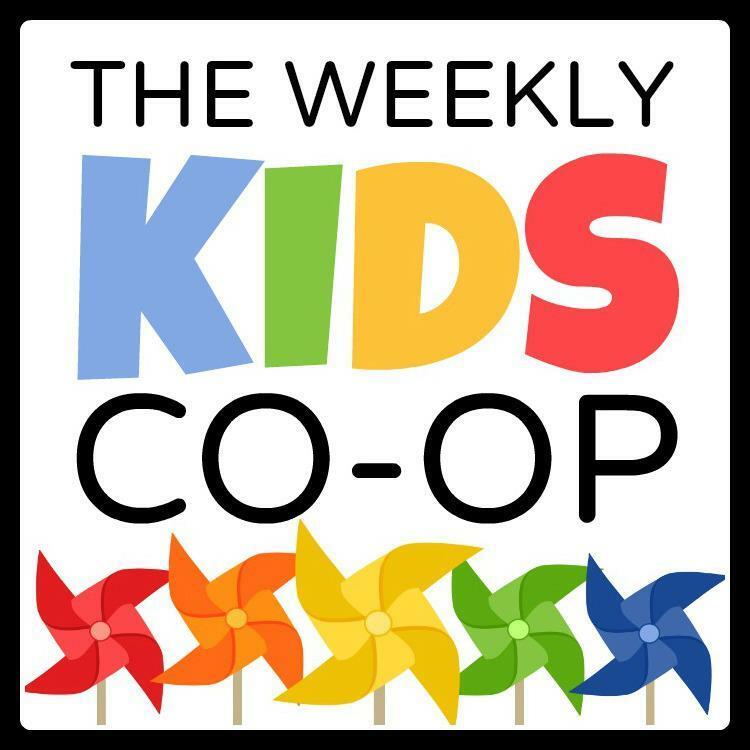 I'm merging my Tot School update with our Letter of the Week Activities for D with my selections from The Kid's Co-Op. Hope you enjoy! When I started my Tot School activities, we kicked off with the Letter A and an Apple Sensory Basket that Caterpillar really loved. Living Montessori now included it in her very thorough and wonderful round-up of 30+ Apple Sensory Tubs -- perfect for focusing on the letter a or for Fall learning. With my popular Things That Go Series, I focused on the Letter B and did Bus and Boat together. Craftulate shared 5 homemade boats, which would be a perfect addition for activities focused on the Letter B, and I shared our Tot School Letter C post last week through The Kid's Co-Op. The basket the boys enjoyed the most during "C Week" definitely was our car basket, and I loved these Learning Activities using Cars from There's Just One Mommy. Before I share our Letter D activities, I'll share the rest of my Kid's Co-Op picks: School Time Snippets shared their Tot School activities for the Letter K and both Wild Flower Ramblings and B Inspired Mama had activities for the Letter P. I definitely want to do Wild Flower Rambling's pig activity and B-Inspired Mama's Polka-Dot Pumpkin is perfect for Halloween. Sunlit Pages has you covered with snakes for the Letter S and Crystal and Company's Watermelon Wagon Craft is too cute for W.
I'm wrapping up with 3 alphabet activities/resources for when your little one is ready to explore all the ABCs and perhaps start building some words: Recycle Alphabet Busy Box from And Next Comes L, Driveway ABC Game from Creative Family Fun and a DIY Alphabet Flip Book from Crystal and Company. Now, to finally share with you our toddler and preschool explorations of the Letter D through all five senses. Sight - I started the week with a simple duck basket and some of our favorite duck books. They especially liked this because they love David Shannon's Duck On A Bike and love playing in the bathtub with their ducks. So, we did some duck hunts around the house with our ducks, some duck hunts in the bathtub (adding some milk caps with the letter D to bathtub playtime) and measured, counted and labeled our ducks, while also reading many of our favorite duck books. We also love going to the duck pond to see the ducks as well. Hear - We moved onto things we hear that start with the letter D and dogs immediately came to mind since our neighbor has two dogs, and Caterpillar notices every little bark. Again, I put together a simple basket with two fun dog books, including the classic Go, Dog, Go! by P.D. Eastman. I took the small dog beads that you see in the basket (in the small orange bowl) and created another activity for the boys that helps with their grip, color sorting and, for Wild Thing, word recognition. I found the chopsticks with chopstick holders at the dollar store. They both really enjoyed this activity. For sound, I also set up a simple drum basket inspired by the Letter D page from ABC Kids by Simon Basher in which Dexter's dog dances dreadfully (in the photo Dexter also plays the drums). The boys took turns playing the drum and making the dog dance and daddy did some dancing and drumming too -- that's lots of letter Ds! Taste - For taste, we did dates and donuts. The dates I featured through Lara Bars with some deconstructed Lara Bars as well -- a plate for them that had a bar and then the bar ingredients all separate: dates, peanuts, chocolate chips. Of course, the big hit, though, were the donuts. Caterpillar and Wild Thing shared a donut from a bakery. Then we attempted to make baked butternut squash donuts at home. They tasted fabulous, but didn't look all that great. (There's a couple of photos on my Facebook page). Our real donut making inspired some Playdough Donut Play, which was a major hit. before he started throwing the playdough around -- that's a really long time for him. Finally, Touch and Smell - My touch and smell items went together: dirt and daisies. 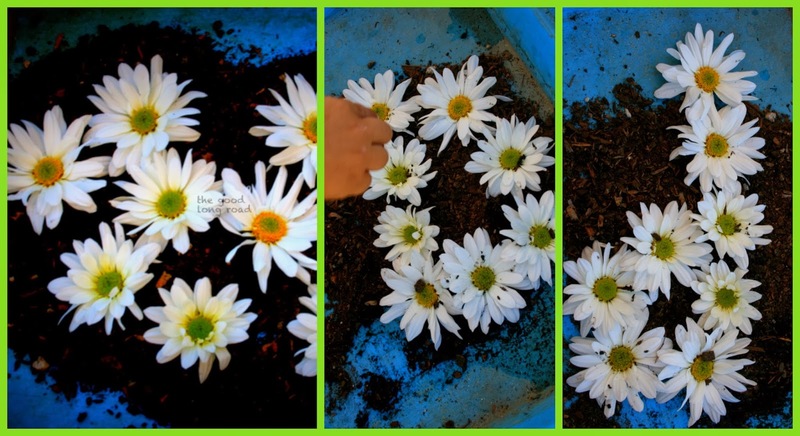 There's more daisy photos and other photos from Letter D Week over on Facebook. and created our culminating Letter D art piece with dog stamping and daisy painting. this wonderful moment with Caterpillar identifying the Letter D for us! Sharing this post at: 31 Days of ABCs, Montessori Monday, Sow Sprout Play Saturday Link-Up, Tuesday Tots, Artsy Play Wednesday, Mom's Library and It's Playtime! Now, it's time to Link Up and Play!